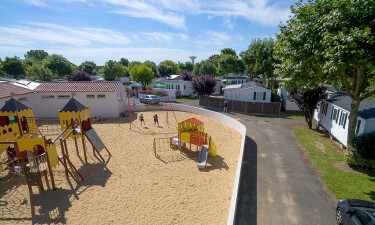 Le Clarys Plage luxury camping is located in Saint Jean De Monts in the beautiful Pays de la Loire region of western France. It is right by the sea and only 400 meters from a wonderful sandy beach, with warm, clear waters. 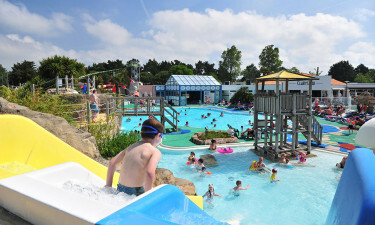 The site provides fun for all ages; they cater to families, couples, and over 55s. They have a large selection of mobile homes available, all with great facilities. Why should you choose Le Clarys Plage LUX-camp? On your camping holiday, you don’t have to bunk down in tiny tents with no running water; you can stay in one of Le Clarys Plage’s luxury mobile homes. They come with decking and parasols on your own outdoor area, as well as a table and chairs and pace for hanging up clothes and storing bikes. The mobile homes have a surface area of 30 m², and have two or three bedrooms, with one double bed and two single beds. The mobile homes include a washroom with a shower and a separate WC. 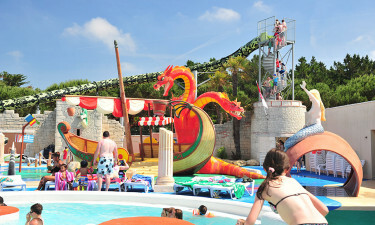 The pool and water playground area at Le Clarys Plage really is a sight to behold. There are large areas by the side of the pool, perfect for adults to relax with a cool drink and take in the sun from a sun lounger, while keeping an eye on their children. Children will love the different slides, lagoons, and rivers, perfect for fun water games. There are water cannons, hop scotch games, a Jacuzzi, water jets, and even a fortress! Your kids will never get bored of the pool area at Le Clarys Plage, so that parents can have some free time for rest and relaxation. There are so many outdoor activities at Le Clarys Plage that your day can be filled with fun from start to finish. For adventurous families, there is the opportunity to have a go with zip-lining, or the balance equipment. For active kids who love sport, there is a multi-sport complex that includes football pitch and other sports activities. 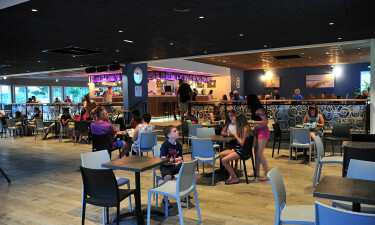 You can even watch sports matches on the large screen TVs in the area. There is also a large playground available for kids, with a sandy play area and a wide variety of equipment. At Le Clarys Plage there are various food facilities for every occasion. They offer true camping luxury, with a pizzeria and a cyber café, as well as the option to takeaway food and enjoy it in the privacy of your own accommodation. Le Clarys Plage has a convenient supermarket where you can pick up your daily essentials such as bread, cheese, milk, and bottled water. You can also get toiletries and international newspapers and magazines.